This is a good time for site owners and bloggers as they do not have to invest in expensive web analytics software for tracking and analyzing visitors to their websites. We now have tons of interesting options like Statcounter, Sitemeter, Google Analytics, FeedBurner or even MyBlogLog that will help you understand how visitors are discovering your site and how they are using it. Abundance of choices can be overwhelming for must users so we'll help you compare and pick the best site statistics package for your website. SiteMeter and Statcounter - This is the most popular breed of web analytics software on the internet that you will find included in the maximum number of websites today. Both the services are similar in nature and very reliable. They will help you track where the users are coming from, what keywords they have used in the search engines, how long they stayed on your site, physical location on the Google Map, what browser they're are using, etc. I somehow prefer StatCounter over Sitemeter since Statcounter allows you to track the activity of last 500 visitors while Sitemeter limits that to 100 visitors. Second, Sitemeter is always visible on the webpage while Statcounter offers an option to hide the tracking icon from web pages. While such data is available through all other web stats software, 103 Bees is fast, uncluttered and less complicated for an average user. One simple report will help you analyze and build upon your organic search traffic. MyBlogLog - MyBlogLog is famous for tracking outgoing traffic in near real time - it will show hyperlinks that your visitors are clicking to leave the website. A neat way to learn about stuff that's currently hot and popular on your website. You can also use MyBlogLog to track Adsense clicks - it won't tell you the specific Google Ad that the visitor clicked to exit the site but you'll know what Ad formats are receiving the maximum clicks on your website. Google Analytics (formerly Urchin) - This Google goodie is absolutely free, generates beautiful charts and also offers several unique features. 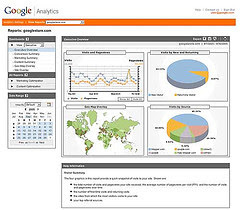 With Google Analytics, you can invite users to view your site statistics in read-only mode, track file downloads from your website, have daily reports sent to your email address in PDF or Excel formats, track external links that visitors are clicking to exit the website and more. Google Analytics is clearly the most comprehensive visitor tracking software recommend for all sites since it even preserves historical analytics data which is quite essential for measuring the performance and improving the website rankings. Awstats - This is not exactly a web analytics program but a log analyzer that extracts data from raw server logs and converts them into more meaningful reports that are pretty easy to understand. Awstats is not for users of Blogger, Geocities, Wordpress.com or Googlepages since these free services do provide access to visitor logs. Instead, the program is for people who are self hosting their websites and have control over logfiles. FeedBurner - This wonderful RSS company which will soon become a part of Google, does provide a free a blog statistics tool that is integrated with your FeedBurner account. While you get the standard details from FeedBurner site statistics, the advantage here is that one service is keeping track of your blog audience as well as RSS subscribers. That makes life a bit simpler. If you have a large site with fairly high traffic, get Google Analytics. There's a small learning curve involved but you'll absolutely love this software once you master it. Finally, if you have hosted the site yourself (say on DreamHost or Media Temple), install Awstats package and setup a cron job that runs at midnight daily. You will be amazed to see the detailed visitor reports that popup on your screen every morning.